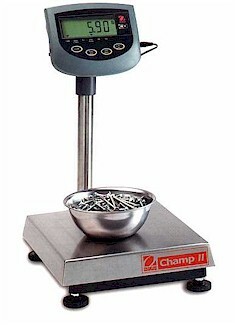 Champ II Bench Scales are Legal for Trade with RS232 bi-directional interface, Net/Gross/Tare function, and Auto-off timer. With rugged steel construction, IP65 load cell, AC adapter. Capacity x readability: 15 x 0.002 lb. 12 x 14 platform. All Ohaus Champ II Bench Scales are protected by a 2-year warranty on labor and parts. All models certified "Legal for Trade"
7 different models with capacities from 15 to 300 kilograms / 30 to 600 pounds.